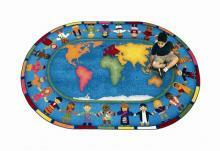 Go around the world on the Kids Area Rugs! Our interactive world has changed the face of early childhood education. 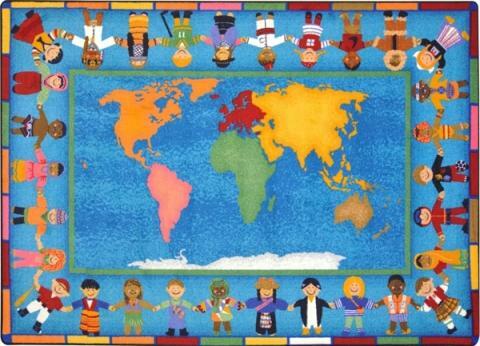 You can no longer afford to put off teaching young children about geography. 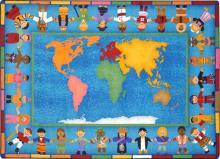 Before they make their first text, they should know about the countries of the world and the people that inhabit them. 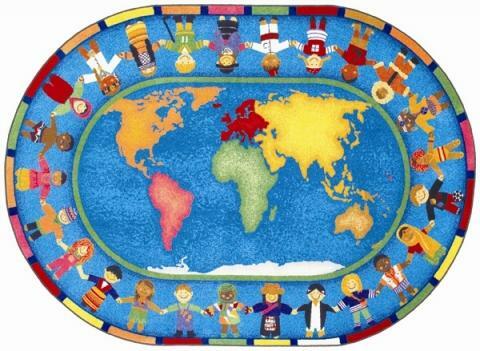 The Kids Area Rugs present a colorful depiction of the world in the center of the rugs, with young children from various cultures forming a border around the rectangular rug shape. This rug gives you the perfect opportunity to introduce your young students to other cultures. We design the Kids Area Rugs with SoftFlex®, which is an air-texturized, polypropylene, secondary back that is the latest advancement in area rug backing systems. The tightly woven fibers not only provide the ultimate in comfort, your students will be insulated from extremely hot or cold classroom floors. Our extremely flexible design eliminates wrinkles, while providing superior under floor support that can handle the most rambunctious children. Your children will not inhale loose fibers or ink dye fumes. These rugs exceed the most stringent indoor air quality standards.